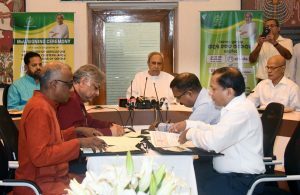 Bhubaneswar:6/11/18:MoU being signed among the Director of Horticulture, Odisha Livelihood Mission & Bharat Rural Livelihood Foundation (BRLF) and Professional Assistance for Development Action (PRADAN) on promotion of Agriculture Production Clusters (APCs) in Tribal regions of Odisha .Chief Minister Naveen Patnaik today launched a special programme on promotion of Agriculture Production Clusters (APCs) at the State Secretariat here. This project will trigger growth in farm sector with an objective of sustainably doubling the income of one lakh small and marginal farmers by establishing Agriculture Production Clusters (APCs) in 40 blocks of 12 tribal dominated districts in the state over a period of 4 years, stated a press note. 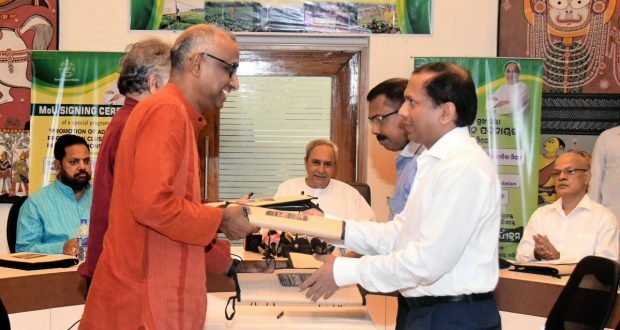 Around 150 farmers will be organized into one Producer Group (PG) who would be facilitated to practise synchronized market linked production of identified crops, especially horticultural crops covering around 40 acres in a contiguous manner. Similar such 20-25 PGs having 3000 to 5000 farmers will be aggregated to form the Agriculture Production Cluster/Producers Company (PC) at appropriate level, the press note added. It further stated that total 30 such Producers Companies (PCs) will be promoted in 40 Blocks Involving around 650 Producer Groups covering 1,00,000 farmers. Around 750 market-linked Agri-Entrepreneurs will be groomed and nested as value chain enablers in these regions. As a sustainable measure, non-pesticidal management (NPM) practices will be introduced in 40% of the areas. To augment the livelihoods of the farmers, livestock (Goat, Sheep and SW) rearing is also planned with around 40,000 families in these clusters. In these regions market routes and actors around identified commodities will be developed. Livelihood assets like irrigation in 16,000 acres, orchard development in 8,000 acres, farm mechanization access to 70,000 farmers and shed for Goat and Backyard poultry with 30,000 farmers will be converged from existing schemes in this project to intensify the interventions, also mentioned the press note. The available schemes with Directorate of Horticulture, OLM, OAIC, APICOL, OLIC and other relevant Departments will be converged for creation of livelihood infrastructures required for farmers in the regions. Prominent among others, the special occasion was also graced by Odisha Agriculture Minister Pradeep Maharathi, Agriculture Production Commissioner Gagan Kumar Dhal, Agriculture Principal Secretary Dr Sourav Garg, BRLF Chief Executive Officer Pramathesh Ambastha, PRADAN Executive Director D. Narendranath and other NGO partners and around 300 farmers were also present in this ceremony.